Meet Our New Clinic Geckos! 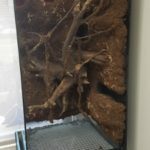 Home » Meet Our New Clinic Geckos! If you’ve visited our clinic recently, you may have noticed a new addition greeting you in the waiting room. We now have a living vivarium, which is currently home to five new clinic geckos! 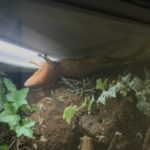 They are all crested geckos and were in need of a home. 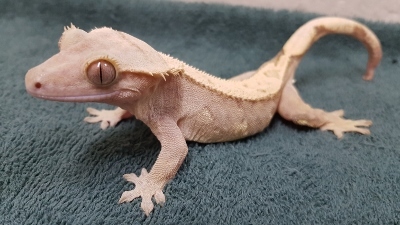 Our own Dr. Evan had the idea to have them live at the clinic and be our official clinic geckos who will greet all of our clients in the waiting room. “A dog and cat clinic might have a cat sitting on the counter to greet you when you walk in. 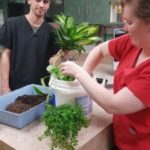 Why shouldn’t an exotic clinic have an exotic species greeting clients upon their arrival?” Dr. Evan said. One of Dr. Evan’s interests is environmental enrichment. 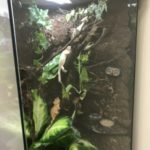 Aside from contructing BBE Trees for clients, he has advised clients on and has personally constructed a number of tanks for reptiles and amphibians, many of which have been living vivariums. 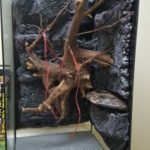 What is a living vivarium? It is a man-made enclosed environment, primarily designed to sustain live plants. It is equipped with its own ecosystem and, of course, an animal resident. 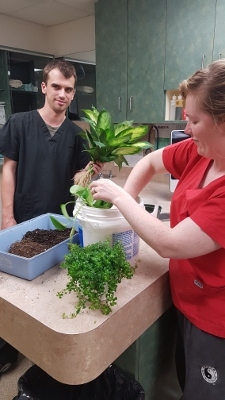 Dr. Evan was excited to build the clinic’s new gecko tank and took this opportunity to mentor some interested clinic staff members to participate in the process of constructing a home for the geckos from scratch. With the eager help of Sarah, Aidan and Caitlin, the project slowly took form over about five days, spanning about six weeks. After acquiring the tank, Dr. Evan built the cabinetry for the top and bottom of the tank. Then the team got to work transforming the empty glass box into the geckos’ new home. 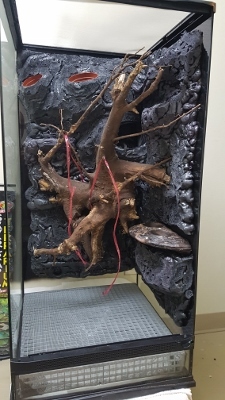 The tank was conceptualized with wood décor and plant locations were mapped out. A false bottom was created to provide for appropriate drainage. A background was made using expandable spray foam, silicone and Eco Earth substrate. 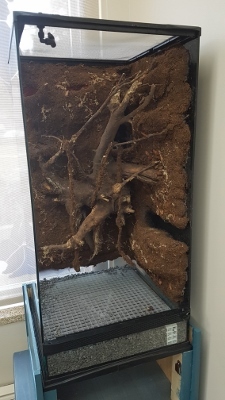 A bioactive substrate was created and added above the false bottom creating the needed draining system for the vivarium’s water table. What makes a substrate bioactive? The addition of isopods, which are little crusteceans who are the cleaning crew of the vivarium. They eat mould and debris and recycle the geckos’ waste into viable plant nutrients. Live plants were then added. 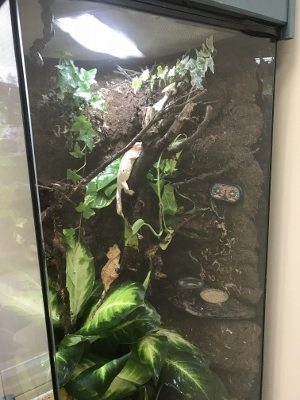 After the lighting and misting systems were set up, the vivarium was left without its inhabitants for another few weeks to allow the system to equalize. Then finally after all the work and waiting, it was time to release the beasts into their new home! The geckos settled in nicely and quickly, scouting out and claiming their own hidden lounging spots! They quickly mastered the skill of blending into their new environment. They are so good at it that you can almost hear them dare you to try and find them all! Think you can? Be sure to try next time you visit us! 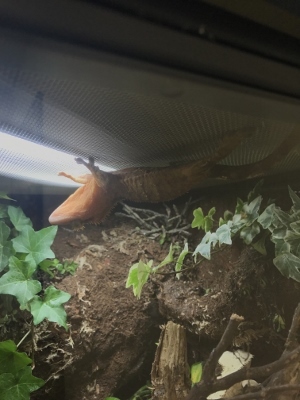 Whether you find all or none of the geckos, next time you visit us, please be sure to check out our new additions and sit back and enjoy the view!